Almost 83,000 Victorian students have received their Year 12 results, 47,000 of whom also received an ATAR. This year, 49,204 students – 26,259 female students and 22,945 male students – have graduated with their Victorian Certificate of Education and 47,032 secondary school students have received an Australian Tertiary Admission Rank. 14,728 students received a study score of 40 or more in at least one subject. Victorian Tertiary Admissions Centre director Catherine Wills noted that the average ATAR for girls was 64.4 and for boys it was 62.2. However, at the highest level, 22 boys received the top ATAR of 99.95, compared with 11 girls. In addition, 12,926 students completed a VCAL certificate in 2014, the most since the introduction of the program 12 years ago. The relevance of ATAR as a university selection tool has been declining in relevance, particularly since the phased introduction of the uncapped, demand driven system since 2010. For almost half of all Victorian degree courses in 2014, the ATAR was just one factor among many – or no factor at all – in the selection process. Of the 1113 courses offered this year, 495 did not have a “clearly in” ATAR requirement by the end of final round offers. They, instead, based selection on a battery of tests, folios, letters, performances and interviews, either in conjunction with (or entirely ignoring) the ATAR. Dr Daniel Edwards, a principal research fellow at the Australian Council for Educational Research, said close to 50% of students are now admitted to university each year without relying solely on year 12 results. He estimates the figure would have been closer to 30% a decade ago. Institutions are increasingly thinking about alternative ways of selecting their cohorts. It’s certainly much more likely that people are getting in based on criteria other than ATAR. The first edition of ACER’s Higher Education Update for 2014 examines the impact of financial support on student decisions to defer, as well as what ATARs and attrition rates tell us about the relationship between growth and quality in higher education. We also explore whether Australia’s medical school admissions tools can or should predict the course performance of students.For more information on ACER’s higher education research please visit www.acer.edu.au/highereducation. While there has been a substantial decline in the proportion of university deferrals in Victoria since student financial support has been increased, location and socioeconomic status continue to play a role in restricting access to higher education. Daniel Edwards discusses the findings of a multi-institution investigation of the ability of Australia’s medical school admissions processes to predict future achievement levels. Strong growth in university enrolments may not necessarily be affecting quality, according to analysis by Daniel Edwards and Ali Radloff. International experience shows that, by putting in place the right conditions, institutions can improve student engagement. Gerald White discusses the need to better organise the proliferation of non-commercially published reports and documents of particular importance in the area of public policy. Minister for education Christopher Pyne has appointed Australian Catholic University Vice-Chancellor, Professor Greg Craven, to chair an eight-member Teacher Education Ministerial Advisory Group. Professional experience: opportunities for pre-service teachers to put theory into practice through quality in-school learning experiences. The other appointees to the group are the Grattan Institute’s school education program director, Ben Jensen; the Melbourne University dean of education, Field Rickards; the chief executive of Independent Schools Victoria, Michelle Green; the president of the Australian Association of Mathematics Teachers, Kim Beswick; the University of Wollongong’s deputy vice-chancellor, Eeva Leinonen; the principal of Eastern Fleurieu School in South Australia, Trevor Fletcher; and the deputy principal of Haileybury independent school in Victoria, John Fleming. Surprisingly there are no appointees from the public education system – the largest employers of teachers. Craven, a longstanding critic of the worth of ATAR scores, saying that university cut-offs lack transparency and are “as easy to rig as a bush picnic race meeting”. Following his appointment Craven said that “generally speaking”, he doesn’t think it’s too easy to become a teacher. The selection issues have been somewhat distracting and the real issues are how can we improve it, which is about melding theory and practice, and subject content with the practice of teaching it. Craven said Australia’s education system is “not a shambles but it deserves to be improved”. I think it’s like any house. You can always improve the painting in the bathroom and you can always find the things that need to be looked at. We know for example we haven’t got enough science and maths teachers. We know for example we haven’t got enough language teachers. About half the people who go to university these days don’t enter on the basis of their Atar score so it’s a very glib line to simply say we have a minimum cut-off of ATAR scores [and] somehow that will fix every problem. That’s not the problem. There are many people with low ATAR scores who, given the appropriate support both before they start university and during their university training, can be excellent professionals and teachers, so I’m not obsessed with ATAR scores and I think it’s just an easy way of giving a line off without actually addressing the fundamental issues in the teaching profession. 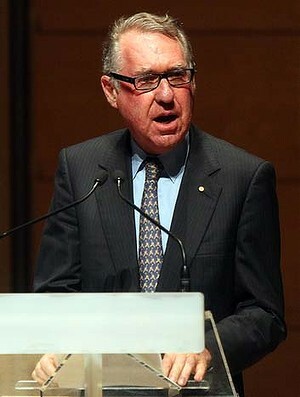 But, rather curiously in the circumstances, Craven did cop a serve from the Australian Education Union’s federal president, Angelo Gavrielatos, who said Craven headed a university that had some of the lowest entry scores in the nation for teaching degrees and was therefore “part of the problem, not the solution”. Gavrielatos called for tougher entry requirements, more rigorous assessment for training teachers, more classroom experience prior to graduation, and an ongoing focus on professional learning and development throughout their careers. School leavers with an Australian Tertiary Admission Rank as low as 33 have been made offers to study for a science degree at one Victorian university. But a leading vice-chancellor called for the common practice of universities publishing inflated and “fraudulent” ATAR scores in an effort to make their courses appear more popular to be banned under the Trade Practices Act. Information on university offers released by the Victorian Tertiary Admissions Centre reveals entire campuses where barely any students with an ATAR above 50 were sent an offer. The new Federation University of Australia, which resulted from the merger of Ballarat University and Monash’s Gippsland campus, has only one course with a cut-off above 50. Of the 12 courses listed with published ATARs, 11 required an ATAR of 47.3 (to study IT) or below. A rank of just 33.35 was required for a science degree. Andy Smith, acting vice-chancellor of FUA, said the university is not concerned about a lack of academic rigour of courses with so many low-ATAR students. Victoria is the only one of the five state tertiary admissions centres that publishes realistic university cut-offs alongside the proportion of offers that went to students with marks below that. Greg Craven, the head of Australian Catholic University and formerly a renowned constitutional lawyer, says that universities in other states engaged in deceptive and unethical practices by telling students cut-off scores were much higher than the reality. There are entire courses at some universities that don’t have a single student who scored above their advertised cut-off. They are nothing more than advertising billboards. What we really have to do is put some trade practices rigour into this system. It should be a matter of public disclosure. He said he would favour a system where universities had to publish their median ATAR. ….teachers having mentors, getting proper feedback about their work, being required to do research on education in collaboration with other teachers, under an umbrella of sustained professional learning. All of which, of course, costs money. Jensen set out four measures, which add up to $6.1 billion a year (about what has been proposed under the Gonski plan, however it’s called now). …the example of (high achieving) students proves that where schools are academically focused, where teachers set high standards and expectations and where parents motivate their children to excel, then it’s possible to succeed. Most of the high achieving students that Donnelly lauds, of course, come from private schools and a couple of high performing public schools in Melbourne’s leafy eastern suburbs. If you follow Donnelly’s reasoning, it follows that teachers at such schools are superior to their counterparts in schools in, say, Melbourne’s western suburbs. And that the students of such schools are almost universally innately intelligent, while their western suburbs counterparts (one could hardly use the term “peers”) must be obviously almost universally inferior in the cognitive department. We don’t think the “values” argument stacks up and neither does Kevin Donnelly stack up. This item was first published in February 2007 on Pluto*. Most people have an opinion on the quality of education provided to the children of Australia. After all, just about everyone has been to school themselves and the majority of older people have had children or grandchildren at school. Kevin Donnelly is no exception, except he’s an “expert”. He’s certainly a prodigious commentator: he’s written a couple of books on the subject and he’s the education commentator of choice in The Australian. You can go here for a fairly comprehensive selection of his commentary. My problem with Donnelly is that, no matter how much he writes, he’s really only got one story. Australia’s education systems are failing and the remedy is “back to basics” – phonics, rote learning, highly structured and prescriptive teaching and learning. Now, there are undoubtedly elements of the story which ring true. 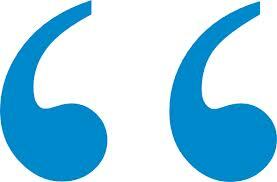 Nothing is perfect – continuous efforts at improvement are to be applauded, as we learned in Blog # 2 – and from time-to-time, as in all areas of human endeavour, teachers and education policymakers stuff up. BUT: by and large, Australian schools do pretty well by most Australian kids. 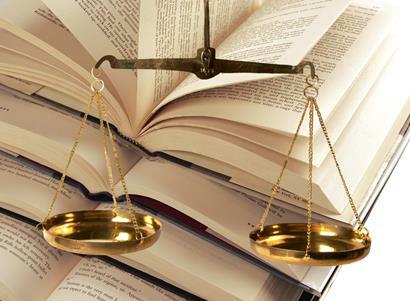 Is Australian education highly equitable? 5 December 2013 | Australia is only just above the average on equity measures. But in Australia – as in so many other countries – life chances continue to be largely determined by parental (especially a father’s) income and occupation. The problem with Australian education equity is that there are a range of multiplier effects. That is, a boy from a low socio-economic background, who goes to a poorly-resourced school and lives in a low socio-economic status suburb in Tasmania for example, tends to do substantially worse than a girl from a higher socio-economic status background, going to a selective or elite private school and living in a high socio-economic status suburb in the ACT, especially in an area like literacy. All of those factors have a significant influence on their educational outcomes. 17 April 2013 | More than half (57%) of Australian Year 4 students were reported to be “somewhat affected” by resource shortages related to reading, 54 per cent by resource shortages related to mathematics and 68 per cent by resource shortages related to science. Forty-six per cent of the principals of Australian Year 8 students reported similar levels of shortages in mathematics and 52% in science. Students attending schools in which principals reported that there were no resource shortages scored significantly higher than students from schools where principals reported being “somewhat affected” by shortages in Year 4 reading and mathematics and Year 8 mathematics. This trend was not found for science achievement. 16 March 2013 | The difference in educational opportunities between the haves and have-nots is ”alarming”, according to David Gonski, the businessman who reviewed school funding for the federal government. In rare public comments over education reform progress, Gonski says he sincerely hopes something comes out of his 18-month review, handed to the government in late 2011. Gonski says an extra $6 billion in funding each year was not a lot of money considering $1 billion is currently spent on schools each week. The plea comes amid doubts over whether the proposed school funding reform will be achieved amid brawling between state and federal governments before the showdown at the Council of Australian Governments. Some clever marketing by the University of Technology Sydney UTS, promoting foundation and sub-degree pathways, aimed at Year 12 students whose ATARs wouldn’t normally get them into UTS. ATARs have risen despite an increasing number of places in many courses. The analysis revealed science-related courses have accounted for 15 of the top 20 degrees in which the final cutoff scores have increased most from 2009 to 2013. The biggest increase was for computer science at Monash University, which required 70 in 2009 but demanded almost 85 this year. The ATARs for science at Melbourne and Monash universities hit a five-year high, requiring 91.95 and 82 respectively in 2013, while recording some of the biggest increases in student places. Almost 2000 science places were offered at Melbourne in 2013, 689 more than 2009. 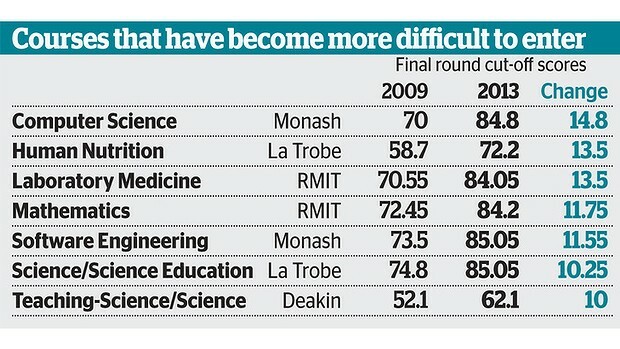 A further 925 were offered in science at Monash in 2013, 206 more than 2009. Education Department figures show the biggest increases in tertiary applications throughout Australia since 2009 have been in science, health and engineering, with the number of applications for science courses surging 40% to 24,183 in 2013. Applications for health courses jumped 25% and engineering spiked by 12%. The biggest proportional increase in intake has been in exercise science at Victoria University, which almost tripled its intake. Its ATAR cutoff has dropped nearly 20 points. Interest in architecture and management courses has dropped and applications for arts units increased by just 0.4%.